LEGISLATIVE LOBBYING SERVICE - C.A.R.S. 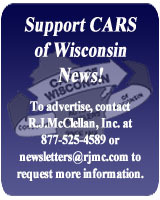 has a hired lobbyist in Madison to insure that our association remains an active participant with the State Legislature. Providing access to crucial information for all our members from the Legislature and the various agencies. C.A.R.S. News - your bi-monthly newsletter full of information pertinent to the auto recycling industry. C.A.R.S. WARRANTY PROGRAM - The ability to sell warranties on sold parts. ANNUAL CONVENTION and TRADE FAIR - provides training seminars, workshops, educational networking opportunities and more. Exhibitors demonstrate a variety of products that can be beneficial to your company. EDUCATIONAL FORUMS AND TRAINING PROGRAMS - meetings and training opportunities for the advancement and new requirements specific to our industry. Includes open discussions and simulations demonstrating day-to-day situations we all face. MONTHLY MEETINGS - The opportunity for you to express your concerns to your Board Members. Meetings are convenient conference calls and held at different locations around the state. Open to all members. 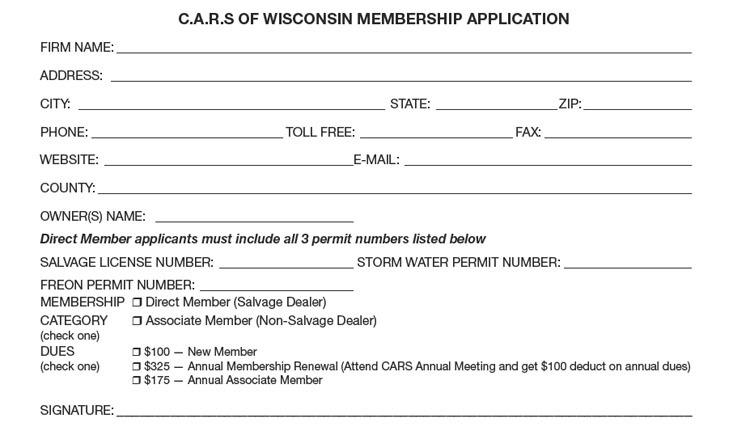 SCHOLARSHIPS - annual college scholarships available for families of C.A.R.S. members and their employees. WEBSITE - Information available 24/7 at your convenience. Click here for printer friendly document.